Ganesha made of Erukku (milkweed) can help you to reduce the impact of ailments. Invoking him with your prayers can bless you to be free from all mental and physical illnesses. This energized statue has absorbed the powerful Vedic chants during the ritual and can radiate this divine energy throughout your residence or workplace. Annapoorneswari is the Goddess of food and grains. Invoking her with your prayers can bless you with non-depleting sources of food and overall prosperity. This energized statue has absorbed the powerful Vedic chants during the ritual and radiate this Divine energy throughout your residence or workplace. Lord Ganesha is the remover of obstacles. Ganesha through his Siddhi powers (special intelligence) know ahead of time the obstacles and can help people to avoid those obstacles because of his special intelligence. This energized statue has absorbed the powerful Vedic chants during the ritual and can radiate this divine energy throughout your residence or workplace. Lord Ganesha is the obstacle remover. You can go to Ganesha when you are confronted by obstacles and unable to overcome them. The giver of super intelligence also acts as your personal problem solver and improves your relationships. This energized statue has absorbed the powerful Vedic chants during the ritual and can radiate this divine energy throughout your residence or workplace. Garuda, the divine vehicle of Lord Vishnu is closely associated with Lord Vishnu. Garuda is powerful to relieve an individual from all kinds of Naga Dosha (snake afflictions). This energized statue has absorbed the powerful Vedic chants during the ritual and can radiate this divine energy throughout your residence or workplace. Invoke the supreme blessings of Lord Hanuman to accomplish the impossible in life. Connecting with him through your prayers can remove negativity, misery, and obstacles, and grant divine protection to lead a life of wealth, health, happiness, and auspiciousness. This energized statue has absorbed the powerful Vedic chants during the ritual and can radiate this divine energy throughout your residence or workplace. Keeping this powerful statue of Lord Hayagriva in your sacred space can increase your concentration and memory power. Students can have this statue to excel in education. This energized statue has absorbed the powerful Vedic chants during the ritual and can radiate this divine energy throughout your residence or workplace. Krishna is both a material God as well as a spiritual God. Krishna can give you whatever you want depending on how you perceive him. Invite his divine blessings to destroy poverty and enjoy material happiness, good progeny and spiritual evolution. This energized statue has absorbed the powerful Vedic chants during the ritual and radiate this Divine energy throughout your residence or workplace. Nandi is the sacred bull, which serves as the divine vehicle of Lord Shiva, the God of Dissolution. Nandi is generally depicted as a seated bull, with all its limbs folded and facing Lord Shiva. Nandi occupies a prime position right in front of Shiva Lingam, in almost all the Shiva temples. This energized statue has absorbed the powerful Vedic chants during the Fire Prayer and can radiate this divine energy throughout your residence or workplace. Lord Ganesha, the elephant-headed archetype and the lord of the angels, is known for removing obstacles. This energized crystal statue has the capacity to absorb the powerful Vedic chants during the ritual and radiate this divine energy throughout your residence or workplace. The Goddess of wealth can confer prosperity, material abundance, good luck, harmony and spiritual prosperity, while Lord Narayana protects the riches and safeguards them against unforeseen financial pitfalls. Together, Goddess Lakshmi and Lord Narayana (Vishnu) carry the energy to enrich your life with vitality. This energized statue has absorbed the powerful Vedic chants during the Fire Prayer and can radiate this divine energy throughout your residence or workplace. Lord Ayyappa, born out of the spiritual union of Lord Vishnu and Shiva has unique powers to control the ill effects of Saturn. 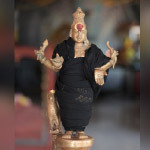 This energized statue can help you to invoke the protective shield of Lord Ayyappa, whose blessings can control the malefic effects of Saturn. Having this energized Ayyappa statue in your space can help receive his graceful blessings. As the guru of goddess Saraswati, the celestial patron of arts and sciences, Hayagriva, horse-headed avatar of Vishnu rules over all forms of knowledge and wisdom. Lord Hayagriva with his consort Lakshmi can bring auspiciousness, good health, wealth, knowledge and stronger marital affinity among couples. This energized statue has absorbed the powerful Vedic chants during the Fire Prayer and can radiate this divine energy throughout your residence or workplace. Kamadhenu, the Divine Cow, is the personification of the Holy Trinity and sum total of all celestial beings, who has the power to grant your wishes. This energized statue has absorbed the powerful Vedic chants during the ritual and can radiate this divine energy throughout your residence or workplace. Goddess Kamakshi is portrayed as seated in an exalted yogic posture ‘Padmasana’, which resembles a lotus and signifies peace and prosperity. She is also revered as the Goddess of fertility and grants childless couples with progeny blessings. She is also renowned for granting her devotees with fame and virtue, among many other blessings. This energized statue has absorbed the powerful Vedic chants during the Fire Prayer and can radiate this divine energy throughout your residence or workplace. Lord Ganesha in the name of Karpaga Vinayagar can be found in an ancient Powerspot. Ganesha is given this name as he fulfills the wishes of the devotees who pray towards him. This energized statue has absorbed the powerful Vedic chants during the Fire Prayer and can radiate this divine energy throughout your residence or workplace. Bhairava, the fierce manifestation of Lord Shiva, has the power to annihilate negativities and destroy evil forces. Bhairava, ordered by Lord Shiva, severed Brahma’s fifth head, which falsely testified witnessing the flame’s origin. Thus, the sole purpose of the birth of Bhairava was to annihilate falsehood, negativity and evil forces. This energized statue has absorbed the powerful Vedic chants during the ritual and can radiate this divine energy throughout your residence or workplace. Lord Krishna, the 9th avatar of Lord Vishnu is a miracle-maker. He can help you to overcome all kinds of sufferings and live life to the fullest. Invoke the blessings of Lord Krishna to destroy poverty consciousness, lack of resources and enjoy material happiness and spiritual evolution. This energized statue has absorbed the powerful Vedic chants during the Fire Prayer and can radiate this divine energy throughout your residence or workplace. Created by Goddess Parvati, Ganesha became the epitome of divine intellect, and he gained the status as the Lord of beginnings and was blessed by Lord Shiva. Ganesha manifested in many unique forms to give specific blessings to devotees and this form is called as Maha Ganapati, the Supreme Ganesha. This energized statue has absorbed the powerful Vedic chants during the Fire Prayer and can radiate this divine energy throughout your residence or workplace. The Airavatham (white elephant) statue carries the energy and blessings of the 11 Ganeshas installed at the Ganesha Vortex for the Golden Age. Agastiya, the leader of the Tamil Siddhas is revered as the Guru. His enlightenment is considered equal to that of Lord Shiva, the “God of Gods.” Keeping his statue in your prayer room or sacred altar and bring his blessing to you. Lord Ganesha, the supreme God, can bust your obstacles and can clear your path towards success. This 3-inch Ganesha statue energized in special energization ritual can bestow you with spiritual and material blessings, guard you against negative forces and grant overall prosperity. This energized statue has absorbed the powerful Vedic chants during the ritual and can radiate this divine energy throughout your residence or workplace. 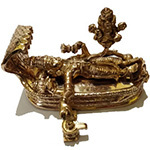 Place this statue of Lord Padmanabha (a special form of Lord Vishnu in a reclining pose on a snake bed with Lord Brahma and Lord Shiva) on your altar to aid you in attaining moksha (liberation from the cycle of birth and death), as well as extreme material riches, good progeny, and removal of wealth-creation obstacles. 108 Crystal Siva Lingam 1 Set (8 to 10 grams) The Siva Lingam represents Archetype Siva in his formless aspect, allowing you to honor the vast ocean of divine consciousness and light in a small form within your home.